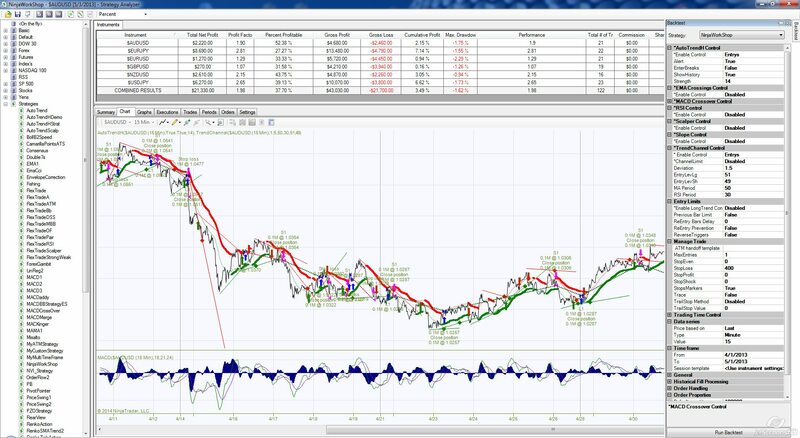 NinjaWorkShop is a full featured fully functional multi-control, multi-entry strategy. It is an early version of a more advanced strategy I market (NinjaWorkshopPro). It was written in a semi modular construct as a tool that I could quickly and easily plug in other indicator controls for testing in a way that could compliment trigger signals of other indicators in a seamless manner and expose all parameters of indicators for tuning to specific instruments and time periods. Each indicator is user configured to be used by itself or in conjunction with other indicator controls as an Entry/Exit/Both trigger. In this basic public version of NinjaWorkShop I have included some industry standard indicators as well as a couple custom ones including AutoTrandH,EMA,RSI,MACD,ScalperH,Slopes and TrendChannel indicator controls. If you are not a programmer and have a strategy idea or a favorite indicator you trade with and wish to add to your core NinjaWorkshop you may contact me ([email protected]) with your requested change/trade-idea/upgrade to enhance this strategy to your specification. • Entry triggers signaled only if ALL active (set to Entries or Both) indicators are generating an entry signal (AND function). • Exit Triggers are generated if ANY active (set to Exits or Both)indicator condition is met (OR function) (Difficult to get in, quick to get out). • Optional handover to ATM strategy of choice. Upon triggered Entry, While under ATM control, strategy still monitors for Exit conditions including ATM exits. • Multiple Stop/Targets methods for trade management. • NinjaWorkShop, in this basic version has 7 indicator controls 5 Entry Limit methods of controlling trade entries and exits. Each control can be independently enabled to work alone or in combination with the other controls. NOTE: To enable trades to be placed live or backtest, set the Parameter : 'OrderProperties/SetOrderQuantity' field to 'ByDefaultQuantity' and 'DefaultQuantity' to whatever number of shares/lots/contracts you wish to enter trades with.